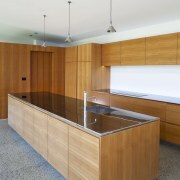 It makes good design sense for a kitchen to respond to the look of its surroundings. But as well as echoing key aspects, another useful element can be introduced contrast. 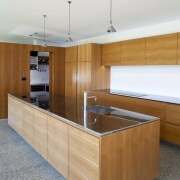 This kitchen was designed by architect Matt Brew in conjunction with the homeowner. Brew undertook the planning and produced initial sketches, then the owner fine-tuned the design and finalized the details. The kitchen's geometric forms extend the strong, simple shapes characteristic of the Desert Modern-style architecture, says Brew. 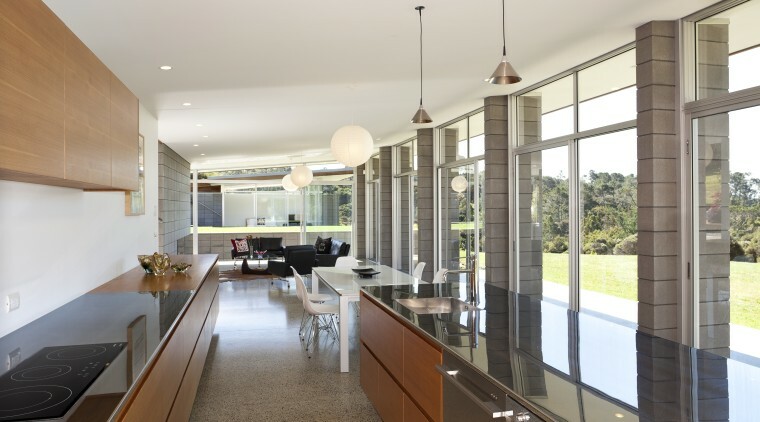 "The interior features quite cool surfaces, such as concrete floors, concrete block walls and expansive windows, so the owner selected a teak wood finish on the cabinetry, to bring warmth to the elongated living, dining and kitchen volume. 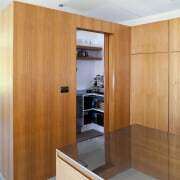 The particular tone of this wood was also suited to the 1950s design style." Concrete block columns, walls of glazing and a concrete floor all offer an abstracted appeal that doesnt detract from the rural views. 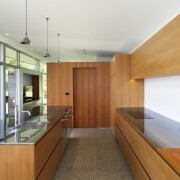 The kitchen falls into line with this broad principle one of the key features of 1950s Desert Modernism. Apart from exuding natural warmth, nearly every other aspect of the kitchen furthers the home's abstracted, pure-form aesthetic. "A second sink, dishwasher, prep space and open shelving are all near at hand, but kept out of sight in the adjacent walk-in scullery," says Brew. "In the kitchen, a glassware washer and oven are tucked on the inside of the island and the large refrigerator is integrated into the cabinetry in the corner." The kitchen also offers a wealth of storage. An extended run of cabinetry, with soft-close hardware, links the kitchen to the dining area. The front and sides of the island also add to the storage options. A close up view of the entire kitchen. 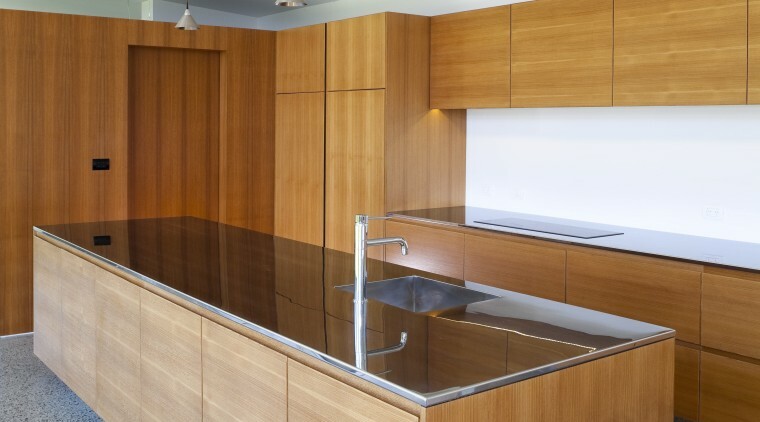 "Countertops are in polished stainless steel, again presenting a furniture-like gleam. The island toekick has a similar finish," says Brew. 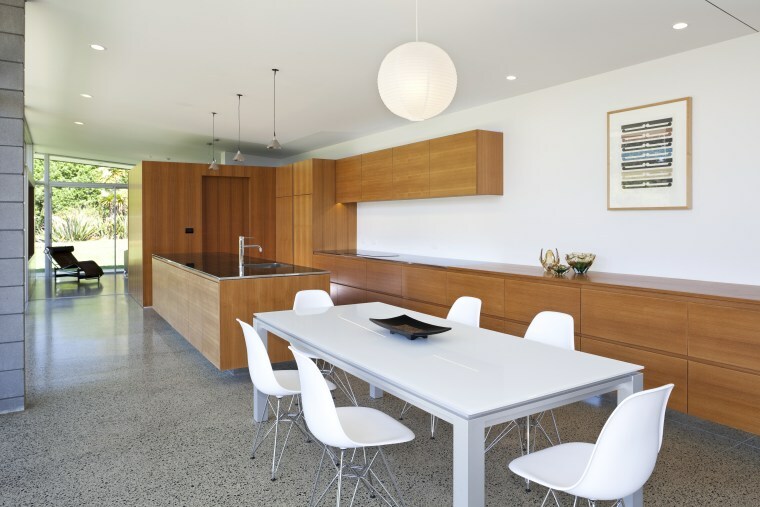 "This reflects the concrete floor, giving the island a floating effect."